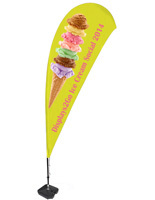 Are teardrop flags the most useful type of outdoor advertising? These economical banner stands are vibrant promotional signs that get exposure when used outside businesses to advertise messaging, brand logos, or events. 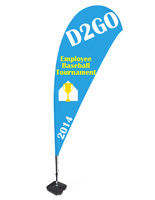 These custom teardrop flags are 11 feet tall for maximum exposure and visibility and made of durable polyester fabric. No matter what the intended audience our online selection provides economical and customizable solutions for every use. 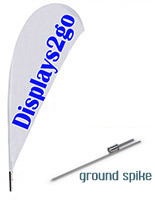 AdvertisingBannerFlags.com sells these high quality outdoor commercial banner stands for promotional marketing displays at wholesale prices. 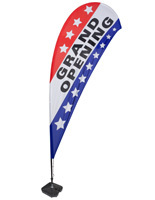 These custom teardrop flags, also known as outdoor bow flags, come in one color, two color, three color and full color printing. Stock messaging for a variety of industries is available in addition to our custom print graphics. 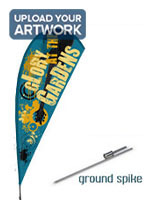 All of our 11' outdoor fabric banners can be ordered in a choice of base stand styles, from hard fillable plastic or cross-base for indoor/outdoor use to sturdy ground spikes for stability in grass, dirt, sand, or even snow. What styles of custom bowhead banners are available? 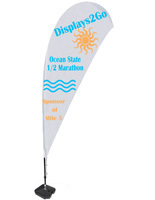 Full color teardrop flags are digitally printed to offer photographic quality reproduction. This type of outdoor advertising display is printed on durable polyester fabric and offers fade-resistant durability. Because the through-print is lighter than with other printing methods, digitally printed bow flags are ideal for double-sided displays where two flags are sewn together, and many custom styles offer both single-sided and double-sided options. Silkscreen printed polyester bowhead flags with custom messages are available with 1-color, 2-color, and 3-color graphics. These eye-catching displays offer single-sided printing with high show-through, allowing a reverse reading image to be easily seen on the back. Silkscreened graphics are a great choice for logos or messaging with block or vector graphics, and are especially economical for bulk purchases of more than 10 flags. 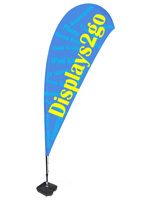 Bowhead banner flags with stock messaging are ideal for attracting customer attention to promotional sales or events. Bold, block text and brightly colored graphics make these single-sided outdoor flag displays a great choice for any business. Classic "tear-drop" flag banners with stands are ideal for businesses who want to attract the attention of passers by in high traffic areas. Sturdy aluminum pole supports are designed to withstand up to 50 mph winds. Cross-base styles are easily stabilized using the included fillable water bag, and our hard plastic bases are specifically designed to be filled with water or sand for stability. In addition to attracting potential customers, custom printed fabric banners with help companies, educational establishments and local governments inform townsfolk, guests or visitors. 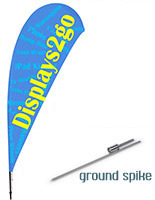 These flag banners, also called bowhead displays, are ideal for showcasing brand logos and graphics, event information, and messaging. Retail stores, commercial businesses, schools and community organizations often schedule outdoor promotional events, and this type of high visibility fabric advertising stand is a great way to attract attention. 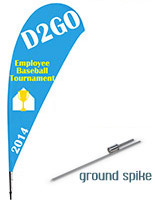 Tear drop banners with sturdy poles offer an economical way to promote sales, clearances, closeouts and more. 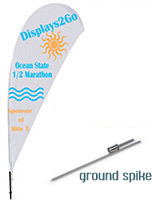 Custom graphic display flags for advertising are also a great choice for seasonal or specialty marketing or promotions. 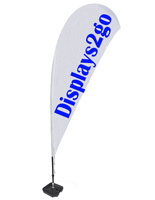 What kind of bases are available for outdoor bowhead banner stands? Cross bases with 4 legs are sturdier than tripod-style bases. 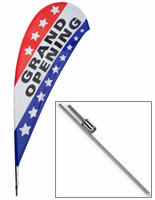 In addition, this type of flag stand can be used either indoors or outdoors, doubling the opportunity for use. Each cross-base fixture comes with a fillable water bag that provides additional weight and stability when placed over the legs. Ground spikes are the gold standard of outdoor flag mounts. This simple stake drives easily into soft ground, grass, dirt, sand, and even packed snow to provide a stable support that holds the fixture upright, even in inclement conditions. Depending on the style chosen, ground stakes can withstand winds of up to 40, and in some cases 50 miles per hour. Fillable hard plastic bases are also designed for use at indoor or outdoor events, and can hold up to 6 gallons of water. The small footprint and high stability of these flag bases make them ideal for use in commercial environments with heavy foot traffic. Custom printed bow-head outdoor banners, with custom printing or stock message displays, are designed to tower over the heads of event audiences for maximum visibility. These fabric advertising fixtures are ideal for building brand or name recognition, attracting customers, and providing wayfinding or event intormation. These versatile fixtures are economical promotional tools for outdoor trade shows, sporting events or competitions, sponsorship booths, product marketing launches, corporate branding, and commercial retail events. The sturdy yet flexible construction with aluminum support poles and stable base options ensures that fixtures will attract attention yet stay in place during winds of up to 50 miles per hour, depending on the style, making these high visibility fixtures a great match for any business or organization looking for high impact merchandising or marketing fixtures.